West Ham bested the Latics 1-0 at the JJB Wednesday. A game which saw nine cards shown in just ninety minutes. Carlton Cole scored the game winner in the 34th minute only to be sent off minutes later for a reckless challenge after having already been booked earlier. After the his second booking the two teams had a bit of a skirmish. Wigan's Cattermole was sent off in the 52nd minute for diving into the back of Scotty Parker.In the 78th minute Jack Collison collapsed on the pitch with what appeared to be a knee injury. 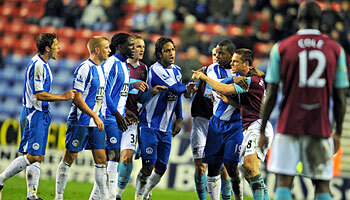 After the game Wigan boss Bruce continued his usual shtick about the quality of referees: While he felt that West Ham deserved the win, he thought that the ref was a bit out of control. He didn't feel Cole should have been sent off at all for what was a reckless challenge when Lucas Neil, according to him, was later able to get away with a much more viscious tackle. He had no problem with Cattermole's booking, saying that he is a reckless individual. Valon Behrami has told the media he will not return this season. He collapsed during last Sunday's win over Manchester City with ankle and knee problems. Though the scans showed no sign of fracture or breaks Valon knows he will not be back until next Summer at the earliest.